When Eamonn Katter visited South Australia’s Clare Valley during the summer he discovered two vineyards that have stood the test of time. The Clare Valley, famous for its wine, has over 40 wineries. Situated approximately 100 kilometres north of Adelaide’s city centre, the valley was first explored in the 1830s, and by the 1840s settlers attracted by the potential of good farmland settled the region bringing with them the first vines. The valley has a charming ‘far from the madding crowd’ feel nestled amongst the Mount Lofty Ranges. With winding poplar-lined roads, historic homes and quaint gardens, it’s a place where real-world stresses are quickly forgotten and visitors feel shielded from the ravages of time and tide. Ruins amidst the vines hint at past settlement. Colours in the picturesque valley change dramatically with the rhythmic seasons of the vineyards. When I visited in the summer heat gave the landscape a golden brown hue. It’s at this time when vines star, punctuating the golden landscape with row upon row of deep green. In winter the vines surrender gracefully to the rich green of fresh pastures and retire into amber hues before being cut back by frosts. Skillogalee’s rustic stone cottage made inviting by its charming garden. Skillogalee, a boutique family-owned and operated winery in Clare Valley, at almost 500 metres above sea level, is one of the highest vineyards in South Australia. The centrepiece of the winery is an old stone cottage built in 1851 by a Cornish miner, John Trestrail, who settled here and operated the property as a mixed farm. Roses and cherry trees (abundant with fruit) surround the cottage which overlooks a dam and hectares of vines. A shady retreat looking out to sun drenched vines. Lattice and roses planted in wine barrels disguise the pump station. View of the vines from ‘Owl Cottage” one of the satellite accommodation homes on the winery. Note the lone deer making a cameo appearance in the grassy opening in the left foreground of the image. Distant view across the vines to the buildings of Sevenhill Winery. 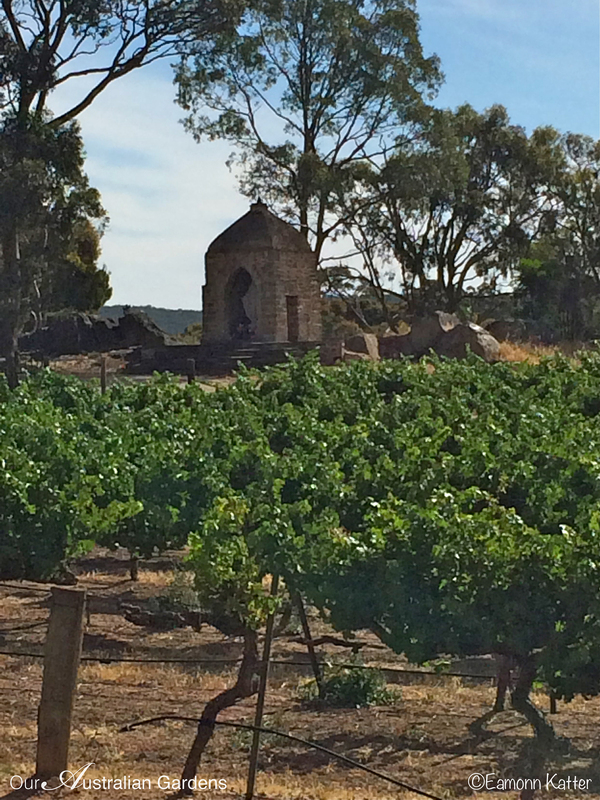 The oldest winery in Clare Valley is Sevenhill which was established in 1851 by Austrian Jesuits who fled their country to escape political and religious oppression. Impressed by the fertility of the local soil, the migrant priests purchased 100 acres of land and named it ‘Sevenhill’ after the Seven Hill district of Rome. They had a vision to establish a Jesuit community in South Australia which could enjoy religious freedom. Vines were planted and the priests began making sacramental wine for the emerging Catholic parishes around Australia. The winery is now one of the most famous in the country and whilst the Jesuits still produce sacramental wine here, it is now also recognised for its production of premium table wines. Vista through to fields from the rear of the Church at Sevenhill. The winery has a serene ambiance, a spiritual place full of religious iconography set into gardens encompassing both new and historic plantings. The long driveway is flanked by this austere and geometric grey and green planting. Pepperina trees now form a solid wall along part of the drive into Sevenhill. The rhythmic planting on the left of the drive gives way to an historic row of Pepperina trees on the right which, through decades upon decades of trimming and training, have been disciplined into forming a solid hedge. Reliable trio of hardy rosemary, roses and lavender. Masses of lavender, rosemary and roses soften the driveway and relieve the severity of the other clipped planting schemes. An old larder or meat drying house has been converted into a grotto for the devotion of Our Lady. The grotto provides a distant focal point and draws the eye across the vines. With wineries like Skillogalee and Sevenhill, Clare Valley makes a worthwhile weekend away for wine and garden connoisseurs alike. Thank you for these beautiful photos and all the information. I will be staying in Clare for a week in September and will be sure to visit these wineries. Beautifully captured and described. I recall this area from from my youth and although now a “tropicaphile”, the schlerophytic beauty of this area still resonates. ‘Schlerophytic’ – a wonderful word Mark. I had only known ‘schlerophyll’ and ‘schlerophyllous’ but it seems schlerophytic is more appropriate for this region. There’s a description of ‘a dry Mediterranean climate being a transition climate between Mediterranean and desert’. What beautiful gardens and wonderful view, all the best.